I, me and myself are all pronouns but they are used differently. Although these three pronouns all represent the same person (first person singular), they have a different role in the sentence, so it is important not to misuse them. I arrived at 8 pm. Clare and I went to the pub last night. You and I are going to a party tonight. My family and I travel a lot. Note in the last three examples that you can replace “Clare and I”, “You and I”, “My family and I” by the subject pronoun “we”. This means you cannot use me here. She wants to come with me. They sent me a lovely postcard. Note here the subject is different from the object. 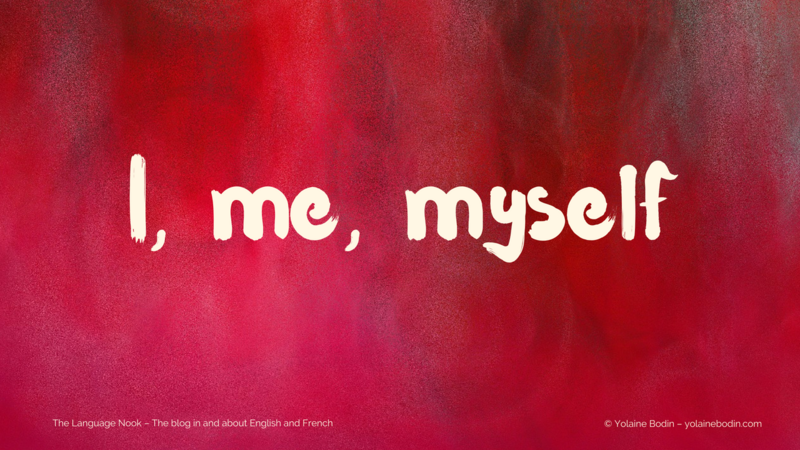 Myself is a reflexive pronoun. It means the subject and the object of the sentence are the same. I cut myself while cooking. I’ll introduce myself to the new team. I → subject of the sentence (I do something) Note: I always takes a capital letter! We prepared ourselves for the competition. She gave them a glass of water. They invited us to dinner. You must tell him now.